I agreed to review Queen for a Day: Recapturing Your Happiness One Birthday at a Time for a very specific reason. I am turning 40 this month and I wanted to re-create my birthday to make it special. Allow me to explain what my adult birthdays have been like. They’ve stunk. They’ve really, really stunk. A few years ago, my birthday went by unnoticed. I didn’t tell anyone at work and, since I was out of state, my family wasn’t around to celebrate it. Talk about bummer. However, most of my birthdays as an adult were pretty crummy because I am the type who doesn’t like attention and doesn’t like people doting on me and whatnot. So, I punished myself by acting like my birthday wasn’t a big deal or that only kids should celebrate birthdays. Turns out, that’s the same kind of thinking that led Linda Sacha to reclaim her birthday and subsequently write Queen for a Day. And, thank God she did. What an absolute delight! 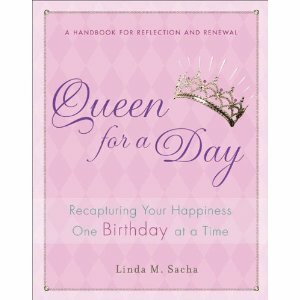 This book is really an exercise in re-affirming your worth and your right to celebrate your birthday. Why shouldn’t we make our birthdays special? We should! Why can’t we take one day (oh, heck, take the week!) to pamper ourselves, do things we truly enjoy, and spend time with people we cherish? We can! If you agree, you need this book. Get Queen for a Day, for yourself, your mother, your sister, and your best friend. And enjoy the rest of your birthdays as you undoubtedly will after reading this wonderful book. Thanks, Linda, for giving me the encouragement — and the tools — I needed to make my 40th birthday (and every one after that) spectacular, on my terms.